U.S.-backed Iraqi troops and their allies expect to defeat the Islamic State (ISIS/ISIL) in Mosul, the jihadist group’s last major enclave in Iraq, within no more than a month. “Despite the tough fighting… we are moving ahead in persistence to finish the battle for the western side within a month,” Iraqi Lt. Gen. Talib Shaghati, the CTS head, told Reuters. Shaghati, the chief of the country’s elite Counter Terrorism Service (CTS), echoed other soldiers and some media reports in his prediction. Coalition troops have already liberated the eastern half of Mosul. Recent estimates place the number of Islamic State jihadists left in Mosul at 500, far less than the U.S.-backed 100,000-strong array of local forces, including Iraqi government troops, Kurdish Peshmerga fighters, and Iran-allied Shiite militias who are fighting the terrorist group. He [Yaaqoub] may be speaking prematurely, but probably not by much. The liberation of west Mosul, which started only last month, has proceeded much faster than expected. That said, the last of the fighting could be a lot more difficult. IS clings on in the oldest parts of the city, where streets are narrow, making it hard to manoeuvre vehicles and increasing the risk of ambushes and civilian casualties. However, tens of thousands have been able to make their way to safety. In the longer term, huge problems remain for Mosul. Many of its people undoubtedly collaborated with the occupiers, and scores will be settled. Sunnis will want to be sure that they are given a full share of power in the city and its surrounding province of Nineveh, even though it is a Shia-dominated army that liberated them. The Kurds will want some sort of reward for their part in beating IS back. Much of the city will need to be rebuilt. Getting the power back on and the water running as the roasting Iraqi summer approaches would be a good place to start. Moreover, Iraqi ethnoreligious minority groups – including the Assyrian Christian, Yazidi, Shiite Turkmen, and Shabak communities – have joined forces to establish a semi-autonomous region that would cover territory in northern Iraq’s Nineveh province, including Sinjar, Tal Afar, and the Nineveh Plain. The move is reportedly separate from efforts by some Assyrian Christian groups who are also seeking to create an autonomous territory in northern Iraq’s Nineveh Plain. “While both groups are working independently to create stability in Northern Iraq, they’ve kept friendly relations,” notes Fox News. Sinjar is a Yazidi-majority region, and the Nineveh Plain is the historical homeland of the Iraqi Christian community, considered one of the oldest in the world. Mosul is the capital of Nineveh province, once the home to the largest concentration of minority groups in Iraq. Although the Iraqi forces are sounding confident about defeating ISIS in Mosul, the terrorist group remains a threat. As Iraqi forces fight Islamic State militants deeper into western Mosul, they face increasingly stiff resistance, with the jihadists using mortar and sniper fire to try to hold off a U.S.-backed offensive to drive them out of their last major stronghold in the country. The fight has taken its toll of dead and wounded on Iraqi soldiers, special forces and police units. The military has not published the number of its own casualties. Islamic State’s tactics, which include taking cover among the civilian population, have also slowed advances in some areas, the closer the battle gets to the more crowded city center. The whereabouts of the ISIS “caliph” are impossible to determine. 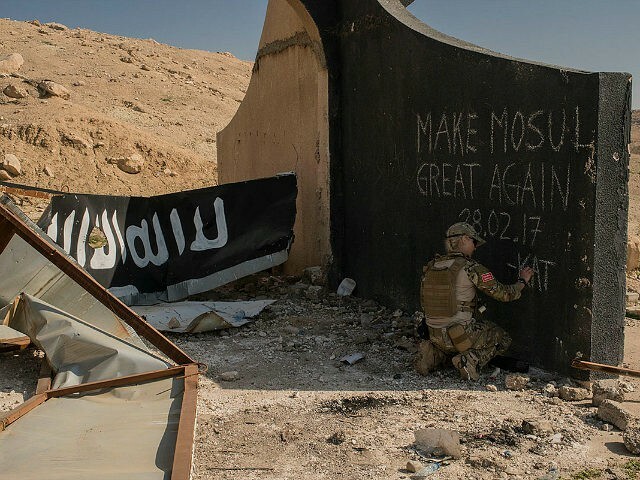 It was at Mosul’s Great Mosque that Baghdadi declared himself the ruler of all Muslims from after his forces captured large swathes of northern Iraq in 2014.